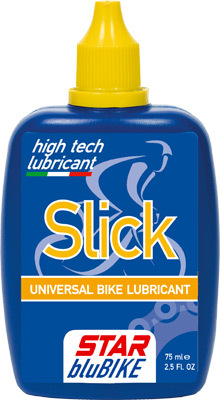 SLICK is a universal lubricant oil for bicycles with a medium viscosity containing special additives that protect against wear and rust, indicated for lubricating all bike parts. SLICK eliminates noise and protects all mechanical parts from humidity and corrosion. This product is ideal for those who use their bike daily or during free time. SLICK is ideal for all types of bicycles and in all weather conditions. We recommend to clean and degrease the moving parts with CHAIN CLEANER or BIO CHAIN CLEANER and to wait some minutes before lubricating with SLICK. Avoid contact to brakes.